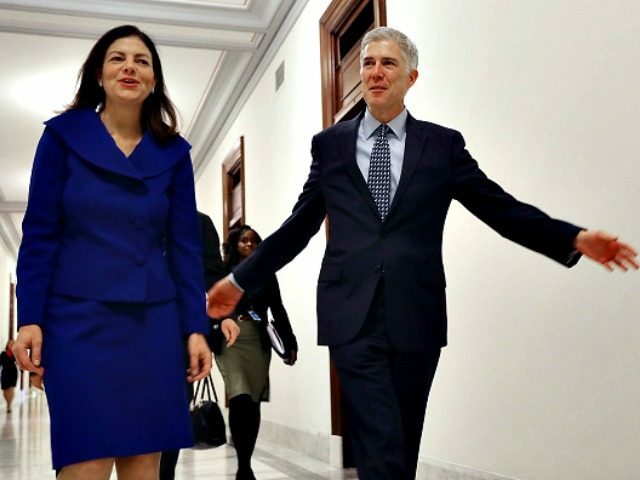 Former New Hampshire Republican senator Kelly Ayotte told Breitbart News it is not true that Judge Neil Gorsuch would not meet with Senate Democrats while he paid visits to senators after President Donald Trump nominated him Feb.1 to serve on the Supreme Court. “Judge Gorsuch met with 80 senators,” said Ayotte, who was asked by the White House to shepherd Gorsuch through her old workplace, where she served with all but seven of the senators expected to vote on the Gorsuch nomination before the end of the week. Ayotte said she and her staff reached out to every senator, both Republican and Democrat, about meeting the judge nominated to replace Justice Antonin Scalia. “As for Senator Cortez Masto? We reached out to her beginning in February,” Ayotte said. The former senator said Cortez-Masto’s scheduler told her that the Nevada senator was unavailable for a month. Ayotte said that, while the judge is spending time with his family pending his potential ascension to the high court, if there were still Senate Democrats looking to speak with Gorsuch before the vote, she would attempt to make it happen. Monday, the Senate Judiciary Committee voted along party lines 11-9 to approve the nomination and move the nomination to the Senate floor.